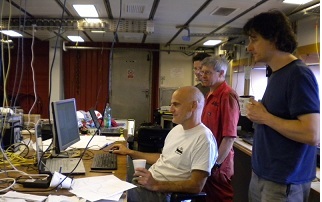 HyBIS spent the night visiting our newly discovered deep-sea vents, this time to study their biology. We don't have a complete picture of life at the vents yet, and when we do our biologists will need to analyse it to see how it relates to life at vents elsewhere. Those results will go into a scientific paper, which has to be checked by other scientists before we can talk about it. It is frustrating not being able to share details of the marine life yet, but those are the rules in science! It only took ten minutes to process the data from the sub because, as Maaten responsible for mission analysis explained, many hours had been spent writing computer programmes to bring together all the information from the sub's systems rapidly into a graph for all to see. The data from the mission looked great: strong Eh signals, showing chemical changes in the water that suggest there may be yet more vents on the seafloor in another area. This forced a change in plans: another survey with the CTD probe in that location, while Autosub6000's batteries recharged for another mission, taking a closer look at this new target. Next we deployed the first of our two long-term moorings. This mooring consists of a 1 km long string of instruments, which will monitor ocean currents, temperature and salinity above the ocean floor. 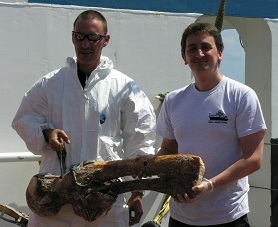 It also carries whale bones and wood to see what marine life colonises these resources in the depths of the Cayman Trough, along with another of Alex's microbial colonisation experiments. We will collect the mooring during our next expedition to the area. 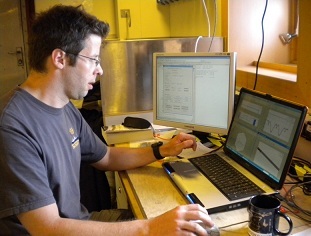 Finally, HyBIS went out on another night-time dive, this time loaded with sensors and water collection bottles to study the chemistry of the deep-sea vents.